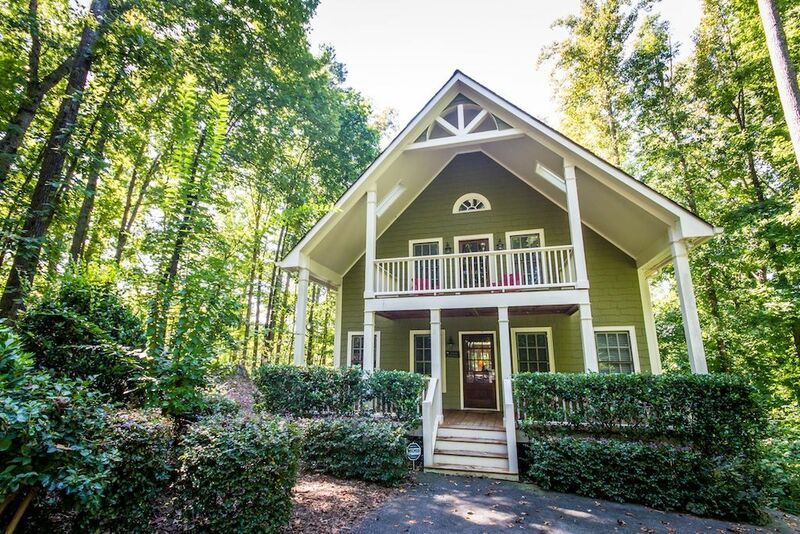 Enjoy the beautiful view of Lake Lanier from this five bedroom, three bathroom luxury cabin situated on a peaceful and secluded lot in North Georgia. This three level cabin features 26 foot floor to ceiling windows, luxurious master suite, hardwood floors, two fireplaces, two large decks overlooking the lake, gourmet kitchen, open floor plan, hot tub, pool table, gentle slope to water, and deep-water dock in a quiet cove. This is the perfect spot to enjoy the lake and spend time with family and friends. The spacious cabin (sleeps 16) also makes a great location for corporate retreats and group outings. Bring your boat (or rent one nearby) and water toys during the spring and summer months. Relax and enjoy the changing leaves, autumn festivals, and holiday gatherings in the fall and winter. The cabin is located 50 minutes north of downtown Atlanta off of GA 400. It is situated on Thompson Creek in the northwest corner of the lake away from all the rough water and crowds. There is convenient access to public boat ramps and a marina with fuel. The cabin is just 10 minutes from the historic town of Dahlonega with its quaint restaurants and shops. Also enjoy nearby golf, Amicalola Falls, pumpkin farms, North Georgia Premium Outlets, whitewater rafting, horseback riding, and the best hiking and biking that North Georgia has to offer. 'Forty something' married, professional couple in the Atlanta area. 2 young kids and a large extended family. We both grew up on lakes and rivers. Love the outdoors, nature, family, adventure, and watersports. My wife and I both grew up on lakes and rivers, and we want to share that experience with our kids and extended family. We love Lake Lanier -- what a beautiful lake!! In particular, we really love the northwest part of the lake since it is farther away from the crowds and rough water. Also, it's closer to the foothills of the North Georgia mountains and all of the wonderful things that area has to offer. For several years, we tried to find a nice, big rental house on Lake Lanier for gatherings with extended family. Unfortunately, we were always disappointed with what was available for rent. Often, the houses were old and rundown with few amenities, and the owners were not very accommodating or customer-service oriented. So realizing that there must be other families out there like ours, we decided to build a house from the ground up specifically catering to the high-end market for larger groups. Our house is one of the largest rental houses available on the lake, and we're sure that you'll agree that our amenities and location can't be beat!! All necessary amenities are on main floor. Just 3 steps to get into the house. Rented this cabin with some family and friends, it was just perfect for us! We'll definitely keep this place in mind for future visits! What a perfect place to have a family vacation! Room for everyone to gather. Go canoeing, fishing, play pool or jump in the hot tub. Huge table for everyone to enjoy an awesome family breakfast and dinner. All amenities you need. Sit outside and see the sunset. Huge master suite upstairs has a king bed, double shower, desk and a private balcony. This was the perfect 50th anniversary gift for my parents. They got to enjoy the suite and be surrounded by family and fun. Great house, very well stocked, clean, Dan was very helpful and patient during our booking process. The kids had a blast! Beautiful property! We had such an awesome week at this lakeside paradise! The kids hailed it as “the best spring break ever”! We loved the area and our trip highlights included: Amiciola Falls, Gold Mining, Antiquing in Dahlonega, the racing hall of fame and moonshine distillery in Dawsonville, and horseback riding in Helen. We would love to return again to see what the other seasons are like on the lake. The house is amazing! We enjoyed fishing off the dock, playing pool, and enjoying morning coffee on the deck overlooking the lake. We had everything we needed and the owner was very helpful and checked on us throughout the week! We've stayed here before and once again it was an enjoyable, comfortable, and spacious place to stay. Beautiful view, comfortable furniture, and a hot tub!